Michael, J. Walsh, L. Goldner, S. Healy, T. Draper, R. Elder, K. McLeod, K. Radermacher, H.
The need for accessible health and support services for older Transgender and Gender Diverse (TGD) Australians is well documented, and reveals the long term impacts of discrimination and stigma . Many older TGD people are reluctant to seek aged care services because of past life events, and fear of being treated with further discrimination . With appropriate training and education, and a supportive organisational culture, aged care workers have a critical role to play in achieving equity and justice within health care . Bolton Clarke (BC) is a large national provider of At Home Support, Retirement Living and Residential Aged Care services. In 2014 BC undertook a Lesbian, Gay, Bisexual, Transgender and Intersex (LGBTI) Inclusive Practice Self-Assessment, using standards developed by Gay and Lesbian Health Victoria. This was conducted to assess the extent to which inclusive and equitable services were currently being provided to LGBTI consumers. In total, 50 items of evidence identified areas of good practice, and 19 recommendations for improvement were made. This informed a BC LGBTI action plan 2016-2020. An area of improvement implemented by BC as part of the LGBTI action plan was a Transgender and Gender Diverse Project. A co-design approach was used with a focus on partnering with consumers. The Partnering with consumers for diversity model received a 2017 Better Practice Award from the Australian Aged Care Quality Agency. To develop and evaluate resources (Digital Diversity Story) to support aged care workers to meet the needs of trans and gender diverse clients/residents using a co-design approach. This project comprised a literature review, working groups, in-depth interviews and a questionnaire. The Working Group comprised of specialist diversity and clinical employees from Bolton Clarke, representatives from Transgender Victoria, Gender Diversity Australia, The Shed (formerly FTM Shed), as well as three people who identified as transgender. A Client/Resident Digital Diversity Story with a transgender focus was co-designed, implemented and evaluated. As part of orientation, employees were given the Diversity Conceptual Model (DCM) and asked to listen to the digital diversity story to identify all the diversity characteristics of the client/resident. Of the 29 new employees who completed a questionnaire 93% said the story was easy to understand, and 72% said it was very good at providing knowledge about how to better understand and respond to the needs of TGD clients/residents. Participants reported back that the digital diversity story highlighted for them: the importance of correct documentation of gender; and fear of discrimination, stigma, illness and mental health issues being important to consider when working with TGD clients/residents. access was important. 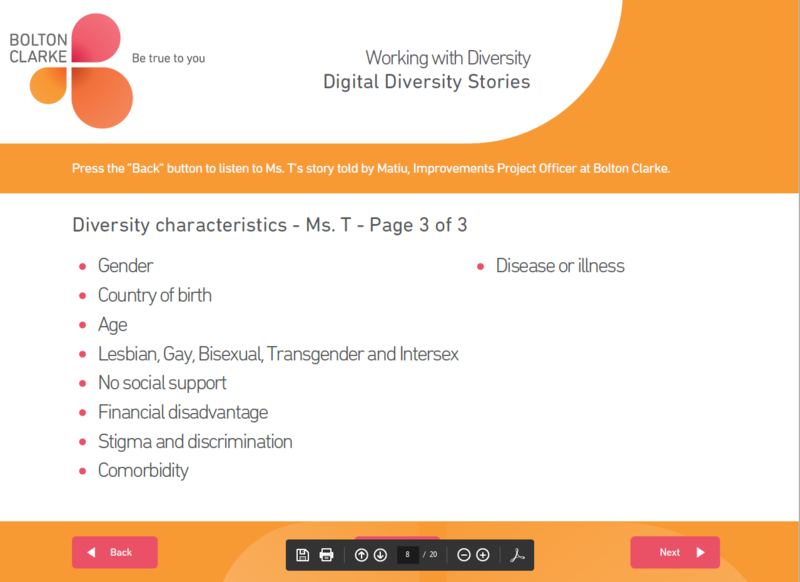 The Digital Diversity Stories will be available free on the Bolton Clarke website www.boltonclarke.com.au in April 2018. 1. Fredriksen-Goldsen KI, Cook-Daniels L, Kim H-J, Erosheva EA, Charles A. Emlet CA, Hoy-Ellis CP, et al. Physical and Mental Health of Transgender Older Adults: An At-Risk and Undeserved Population. The Gerontologist. 2014;54(3):488-500. 3. Reynolds R, Edmonds S, Ansara YG. Silver Rainbows: Advances in Australian ageing and aged care. Australasian Journal on Ageing. 2015;34:5-7. 4. Lindroth M. Competent persons who can treat you with competence, as simple as that’ – an interview study with transgender people on their experiences of meeting healthcare professionals. Journal of Clinical Nursing. 2016;25(23/24):3511-21.